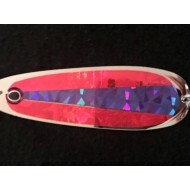 A very hard to find custom made lure by Glitter Bugs. 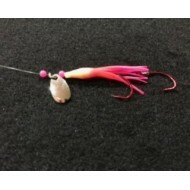 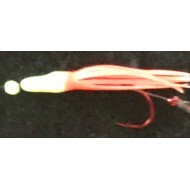 These lures have proven to be one of the hotte.. 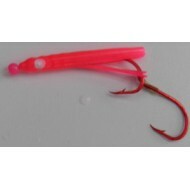 I have used these dodgers and I had great success with them. 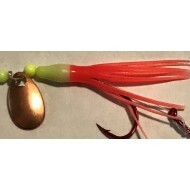 Custom made lures by Glitter B..
Glitter Bugs Dodger Pink/Gold Butterfly 4.5"
Glitter Bugs Hoochie Orange Speckle Glow with Fire Tiger Blade 1 3/4"
A very hard to find custom made lure by Glitter Bugs These lures have proven to be one of the ..
Glitter Bugs Micro Hoochie Chartreuse/Orange w/Indiana Gold Blade 1 3/8"
Glitter Bugs Micro Hoochie Dbl. 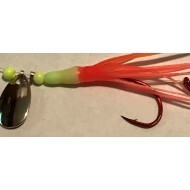 Glow Spinner Wh/Ch/Gr 1 3/8"
Glitter Bugs Micro Hoochie Gold Blade Green/Purple 1 3/8"